Well i think it is safe to say that am in love with zombie books! I got this this book for my birthday because it was recommended by a friend and am glad that i got it!! 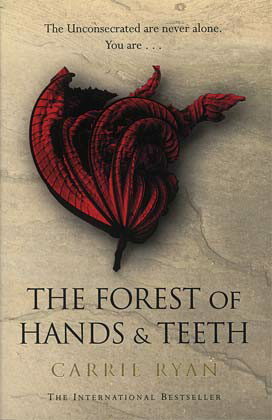 Stuck in a small village fenced in and surrounded by the forest of hands and teeth Mary dreams of the world her mother tells her about, a world with an ocean! when her mother is infected by the unconsecrated ( the zombies) Mary loses everything. With both parents lost to the forest she is sent by brother Jed to live with the sisterhood the rulers of the town.when an outsider comes to the cathedral Mary starts to question the sisters and finds out secrets the rest of the village don't no.she questions whether there is a world outside the fence and whether the ocean is out there! When the fence is breached and Mary's village is under attack Mary has a chance to escape the village with her almost husband harry his brother Travis who Mary is in love with her friend Cass, her brother and his wife and a small boy Jacob. In trying to survive life outside the village the group most fine a way to shelter food and resources but as we all know plans don't always go as planned! Will the group find shelter and food away from the unconsecrated? will Mary finally find the ocean and will it be all she expects? I loved this book but at the same time i found it heartbreaking! I found the book a little slow to get in to at first it spends a lot of time setting up the seen and explaining the rules of the village. the book is rather dark and doesn't have many happy life is good moments it really makes you think and you feel really sorry for some of the characters. it is still an amazing book!! just if you like happy endings your not going to get one. if you like complicated romance, action and zombies this is the book for you! At the beginning of the book i felt so sorry for Mary Harry who she doesn't love asks her to marry him, She loses her mother to the forest of hands and teeth and she is sent by her raged brother to go and live with the sisterhood! In the village survival is dependent on people having children hence marriage is based on commitment not love which is why Mary doesn't want to marry harry but his brother Travis! so when Travis is brought top the sisters and Mary sits and tells stories of the ocean to him i still feel sorry for her because Travis's future wife is also there! however when she leaves the village i stop feeling sorry for her she is an irritating little moan! as the village was invaded she gets out of her marriage to harry and gets stuck in a house alone with Travis which is what she's always wanted! and guess what she sits in the attic ignoring him! in short she would put her dream of seeing the ocean before love! i live on the see front and see the sea everyday so can imagine what it would be like not to no what it looks like but would i give love up to see it?... no! what is the point in seeing something wonderful if the people you love aren't there to see it with you? The book does leave a lot unanswered Is her brother still alive? do the rest of the group survive? does she go back to help then? how many people are outside the fence? is there any survivors in her old village? The book seems to end suddenly with no real conclusion, i think the book could have been longer because somethings aren't explain very well . All the same i cant wait to read the rest of the series and i hope some of my questions will be answered!